Fantastic cover, fantastic album! Guitar maestro Danny Berdichevsky and his boys have here crafted a great package of twelve dazzling pieces which vary in style, tempo, mood and intensity. Those who are familiar with the band will all know the frenetic opener, their superb rocked-up version of Rimsky-Korsakov's classic 'Flight Of The Bumblebee' - here renamed 'Flight Of The BumbleBEAT'. The superb work of Danny here sets the scene perfectly for what is to follow. 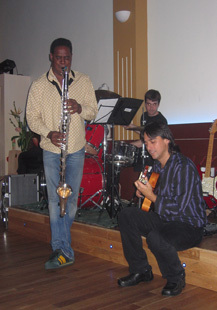 Though elements of rock, classical and Flamenco all bubble up from time to time, the main angle here is jazz. Beautifully languid Berdichevsky compositions such as 'Ocean Tales' and 'The River' call to mind the heyday of classical-rock combo Sky, while works by composers as diverse as John Coltrane and Paco De Lucia are rendered in great style by the band and an impressive array of guests including John Helliwell, John Etheridge, John Hackett, Peter Banks and Hugh McDowell. Berdichevsky's own guitar-work is as breathtaking as ever, and the interplay between this and the exquisite keyboards of co-conspirator Gonzalo Carrera is a joy to behold - with their band-mates Ollie Usiskin, Lakis Economou, Steve Stephenson and Rob Statham all making their presence felt by their own stylish musical contributions. An album for lovers of ALL music, this one - the musicianship here is of the very highest class, and the music itself is complex, evocative and very, very enjoyable. 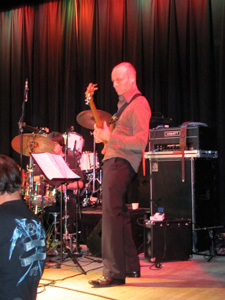 If anyone fancies getting high on pure, present-day jazz and fusion, then go and see the one and only db-Infusion. I had a double stroke of luck one October night in Hertfordshire's inconspicuous Letchworth Garden City, having seen my favourite two bands sharing one stage. Db-Infusion were on the same bill with the legendary Focus, which was a very promising combination. And indeed, the Plinston Hall rocked that night, at several points nearly taking off towards the skies of progressive jazz/rock paradise. 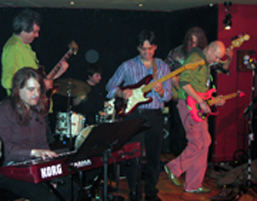 With hypnotising arrangements and brilliant performance of Gonzalo Carrera on keyboards, Danny Berdichevsky on guitar, Ollie Usiskin on drums and Ben Hillyard on bass Db-Infusion delighted the audience with powerful songs from their well-acclaimed album Dreamscape, such as "Yo Yo" or "Its 1 of Those Days". They also caused a stir by Isaac Albeniz's Asturias and a breath-taking fusion version of Rimski-Korsakov's Flight of the Bumblebee. The musical proficiency of this dynamic band combined with their invention and passion invariably results in an extraordinary experience for their audiences. The Saturday night of the Wath Beer festival turned out to be, for me, probably the most exciting night's entertainment the CRS have put on this year, not just in terms of the quality of the musicianship but the sheer diversity of the material performed. First up were our good mates Danny Berdichevsky and Gonzalo Carrera, 'Acoustic Infusion'. Their virtuosity is well known to us and it was interesting to see that all the irritating chatter from the bar abated once they got into their stride. They played a dazzling set opening with a beautiful, mesmeric piece called Asturias and including some of the db-infusion favouirites such as Yo yo, Mi Conchita and The flight of the Bumblebeat. How many other support acts have boosted two such talented musicians? Following them would be a daunting task. 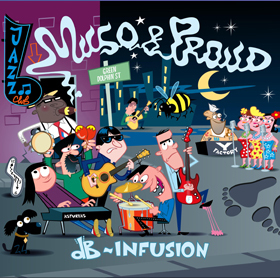 Infusion's brand of instrumental jazz has developed a more confident sound. 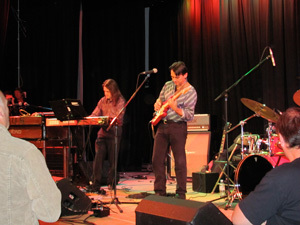 Danny Berdichevsky leads the band on electric and spanish guitars with Gonzalo Carrera on keyboards, Ollie Usiskin on drums and Lakis Economou on bass. 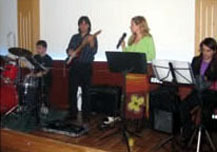 The band played a number of tracks from their acclaimed album Dreamscape. These tracks gave every member of the band a chance to shine. 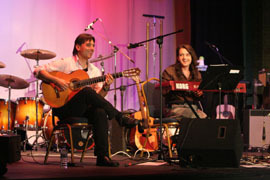 With Danny leading the way on guitar and Gonzalo exercising his fingers with piano keyboard. Highlights of the set were the better known pieces Asturias and the band's regular crowd pleaser Flight of the Bumblebeat. Nicolai Rimsky-Korsakov composed this piece over a hundred years ago - he could never have imagined how his little interlude would be rearranged as a dazzling piece of jazz/classic/rock fusion. No wonder dB-infusion were chosen for this gig .they are great musicians. they can do the impossible. then exploded during turing the heavy metal version of "The Toreador March. INFUSION AT LONDON SPICE OF LIFE ON APRIL 5th 2007. 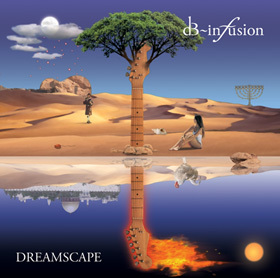 "Dreamscape - The multi-talented Infusion is back with an absolute jaw-dropping piece of jazz-rock or jazz-fusion, depending on what your take is. Superb musicianship and equally spellbinding material make for a superb listen. The basis of Danny Berdichevsky, Gonzalo Carrera, Rob Statham, Ollie Usiskin and the late Steve Stephenson is high-energy in itself, but when they can draw on the saxophonic’s of John Helliwell, cello of Hugh McDowell, guitar of John Etheridge and flute of Rowland Sutherland plus a whole host of excellent guests it comes out of the mincing machine as something very special. to hear some of the acoustic guitar work of Berdichevsky alone is a treat and you must have ears painted on not to appreciate what is happening. There’s some pretty stirring piano and bass work from Carrera and Statham respectively. Great stuff!" "I really enjoyed the gig at the national theatre, greatband, great musicians with excellent dexterity combined with verybeautiful melodies and a nice mixture of flamenco, jazz rock andfusion. One of my favourite songs of the evening was dark and blue. Iindeed predict a great future to these guys." "Fusion can take in rock, jazz, blues and traditional styles, but itwill never be top of the pops. All the more reason to admire what theseextremely talented musicians produce, since the end result is notcrowds of girls screaming. The ironic fact though is that musicianslike these have more musical talent in one hand than 90% of those youcan find in the popular charts..."
"This was one of those magical gigs that fully lived up to its billing.First on stage were the brilliant INFUSION. Support bands often get araw deal, and often have to put up with people laughing, shouting,buying drinks and generally not paying them attention - but nottonight. From their lively opening piece Yo-Yo, this excitingjazz/rock/fusion outfit had the crowd spellbound, and by the end oftheir set were getting rapturous applause. 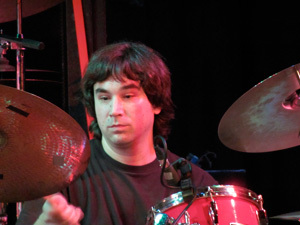 Gonzalo Carrera is well known to CRS, having played with almost as manybands as Martin Hudson has had birthdays (sorry, couldn't resistthat!). He's a great guy, and it is a mark of his talent as a keyboardplayer that tonight he was no way overshadowed by Oliver. Listening tohis excellent work on a manic Flight of the Bumblebee (which worksreally well given the fusion treatment) was a pleasure. His mate DannyBerdichevsky is equally talented on the guitar and contributed somebreathtaking playing, his flamenco influences surfacing on theenchanting Jerusalem; to hear these two maestros on pieces like LittleDrops of Rain (which they dedicate to percussionist Steve, who sadlydied in a car crash) and Dark and Blue made this a memorable eveningfor me and, I'll bet, many others. They were offered fine support bythe excellent Ollie Usiskin on drums and the intricate bass work of RobStatham, and went down a storm with the crowd - they must be one of themost talented bands ever to have played a support slot for the CRS:let's hope we see them headlining one day!"